This blog post is sponsored by iHerb. All opinions are 100% my own. I’m a beauty product junkie, to say the least. While I love keeping things green (and affordable!) by making my own, there’s just something to be said for strolling drugstore aisles and tossing new bath and beauty products into my cart. It’s like my childhood shopping spree fantasies come to life. Only as an adult, I get googly eyes for all the natural products, free of chemicals, fragrances and artificial gunk that makes me break out in hives. But since natural beauty products that don’t cost a fortune can be hard to come by, lately I have been doing most of my strolling online. Thankfully iHerb has been embracing natural brands for a long time and their online store makes it a cinch to find them. They carry over 35,000 natural products and ship to over 160 countries. Not sure where to start? Here are four of my favorite bath and beauty brands you’ve probably never heard of, but should totally check out. 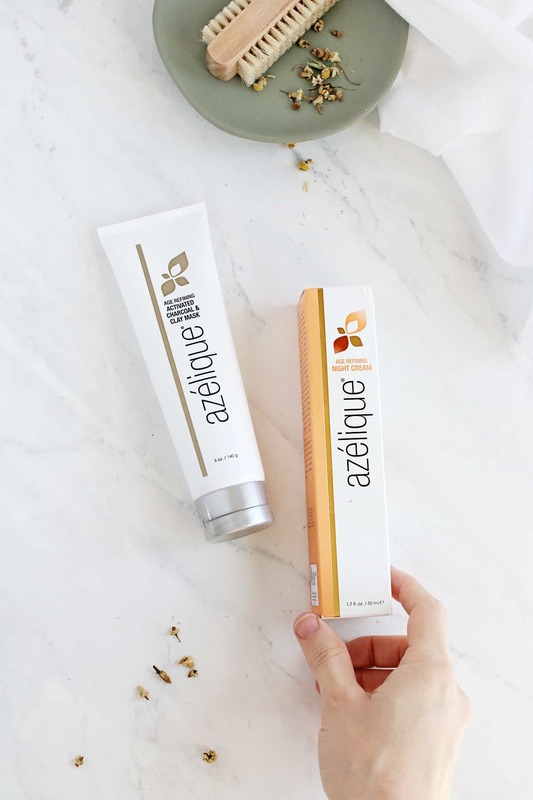 For daily use, Azelique has an Age Refining Cleanser, Moisturizer and Polish to fight free radicals and keep skin looking fresh. While I love wearing their skin-soothing products under my makeup, my two go-tos are the Activated Charcoal Mask and the Age Refining Night Cream–both contain Azelaic Acid, which reduces hyperpigmentation, normalizes oil production and hydrates skin. I use the Activated Charcoal and Clay Mask to detoxify my skin and absorb excess oil, especially during hormonal breakouts. It’s super buttery so it feels great on your skin and it’s not too drying, which is perfect for cold winter months. And the Age Refining Night Cream is a must for restoring skin elasticity and hydration while you sleep. It’s a hybrid of a serum and a moisturizer that helps reduce the appearance of fine lines and exfoliates dead skin cells. You can even use it in conjunction with the Age Refining Eye Cream to repair crow’s feet and dark circles overnight. I live for the evening hours when I get to wash off my makeup and slather on a facial serum. Weird? Totally. But I just love that squeaky clean, hydrating feeling that comes from a post-cleanse moisturizer. 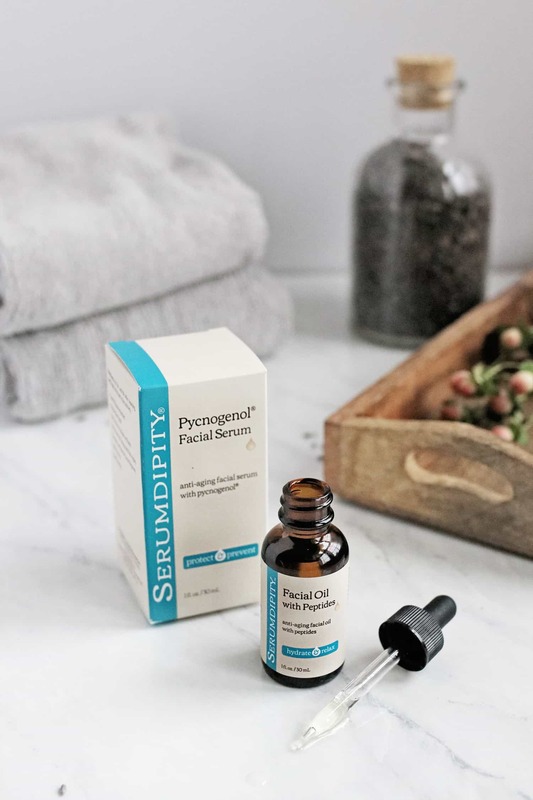 Serumdipty has a whole line of facial oils and serums to help hydrate and rejuvenate tired skin. 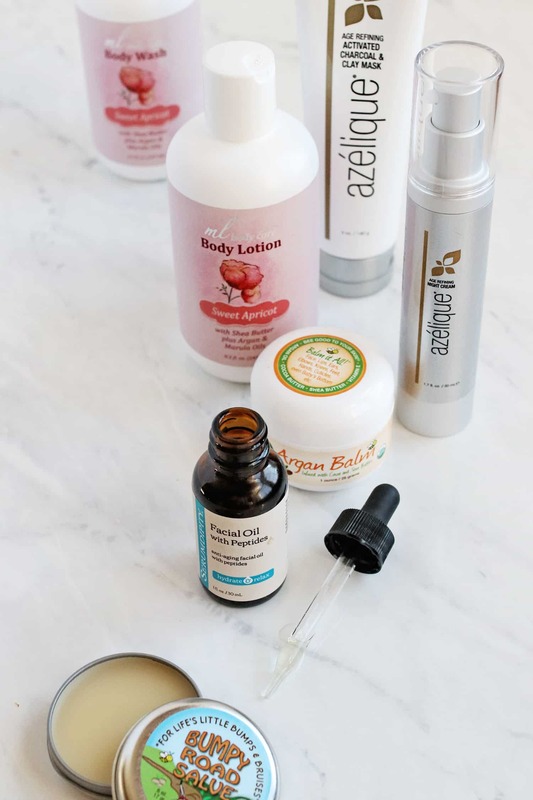 While they have mainstays like Vitamin C, Hyaluronic Acid and Retinol, my favorites are the Facial Oil with Peptides and Pycnogenol Facial Serum. Both nourish from the outside in, help prevent UV damage and lightly hydrate skin. Apply to freshly cleansed skin for a dewy, healthy glow. I usually apply the Pycnogenol Serum at night to help repair my skin while I sleep. And I keep the Facial Oil with Peptides next to my desk so I can hydrate during the day. I simply rub a few drops between my hands and pat it into my skin (on top of my makeup). It immediately makes my face feel less dry and flaky, which I love this time of year. 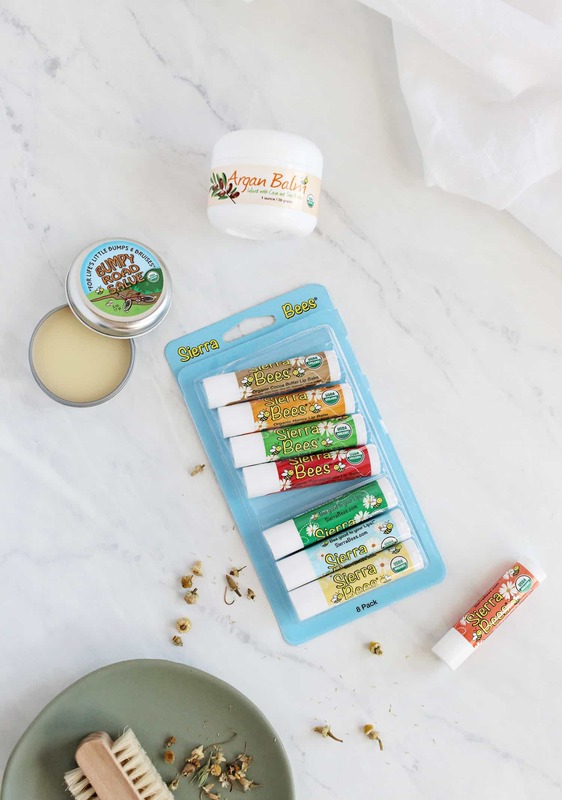 Sierra Bees line of skin and lip balms are all organic, eco-friendly, cruelty free and super affordable. I’m never without the Organic Lip Balm variety pack in our house, and I keep tubes stashed in the car, my purse, random drawers, you name it. It’s super creamy and it stays on a long time, plus it doesn’t dry your lips out like some of the other brands on the market. Even my husband, a certified lip balm snob, swears by the Cocoa Butter Lip Balm. For bumps, cuts and bruises, the Bumpy Road Salve is great to have on hand. It smells amazing and it quickly relieves pain from bee stings, bug bites, scratches or cuts. I stash a tub next to the kitchen sink to apply to cracked skin and brittle nails after doing the dishes. And in winter months, the Argan Balm is the perfect all-purpose balm. Rub it on dry elbows, cuticles, lips, even eczema patches and bug bites. It’s a hard balm, thanks to the cocoa and shea butter, so a little goes a long way. 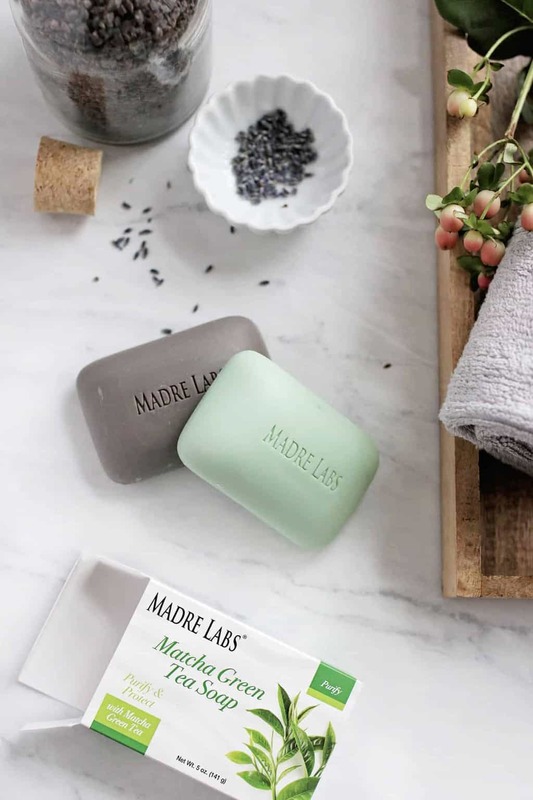 Natural, paraben-free beauty products that smell amazing are hard to come by, so I always stock up on Madre Labs products whenever I order from iHerb. Madre Labs makes everything from nutrient-rich shampoos and conditioners to detoxifying soaps and luxe lotions. And although they pride themselves on green products, none of them will break the bank. As someone with incredibly fine hair, I’m always on the hunt for products that make my hair look thicker and fuller. 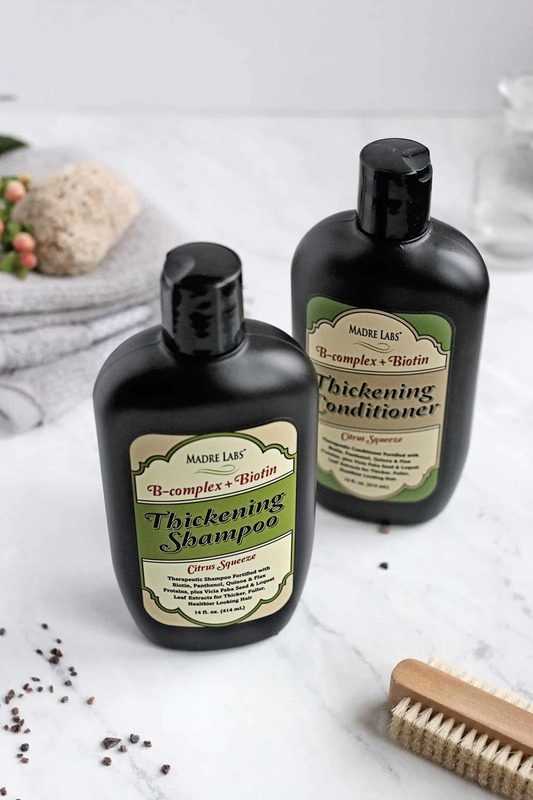 This Thickening B-Complex Shampoo and Conditioner contains B Vitamins and Biotin to help strengthen and nourish hair, and support optimal oil production. The shampoo is light and a little goes a long way. Plus, it hasn’t left my hair feeling static-y like some other products do. While I’m usually a body wash kind of girl, I can’t get enough of Madre Labs Detoxifying Clay Soap and Matcha Green Tea Soap. The Detoxifying Clay Soap uses Ancient Clay to draw impurities from skin and replenish trace minerals. And the Matcha Green Tea Soap is an inexpensive way to get the anti-bacterial and skin-beautifying properties of green tea as part of your daily bathing ritual. Both soaps contain essential oils to nourish skin and help lock in moisture. I also love ML Body Care’s skin-soothing line of body products. 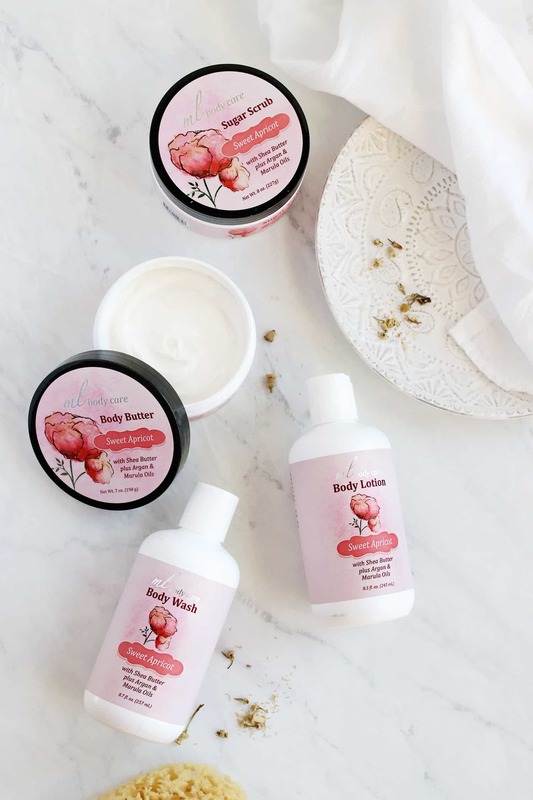 You can choose from Body Scrub, Lotion, Body Wash and Body Butter in several different scents, like Citrus Splash, Sweet Apricot and Tropical Mango (my favorite is the apricot). They’re loaded with moisturizing shea butter, argan and marula oils to keep your skin feeling silky smooth and they smell fantastic. The body scrub and body butter is especially amazing for getting rid of dry, flaky skin. I’ll do a quick scrub in the shower and follow up with the body butter as soon as I get out. It’s thick and nourishing without feeling greasy, and it sinks in immediately. Ready to stock up on natural bath and beauty products for the new year? 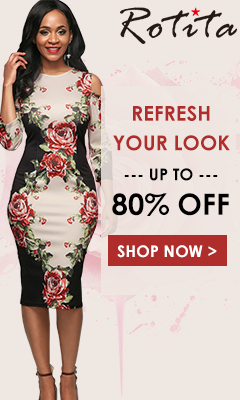 You can get a discount on your order when you use this link.